John Ladd has seen just about every incarnation of the border fence separating his cattle ranch in Arizona from Mexico. 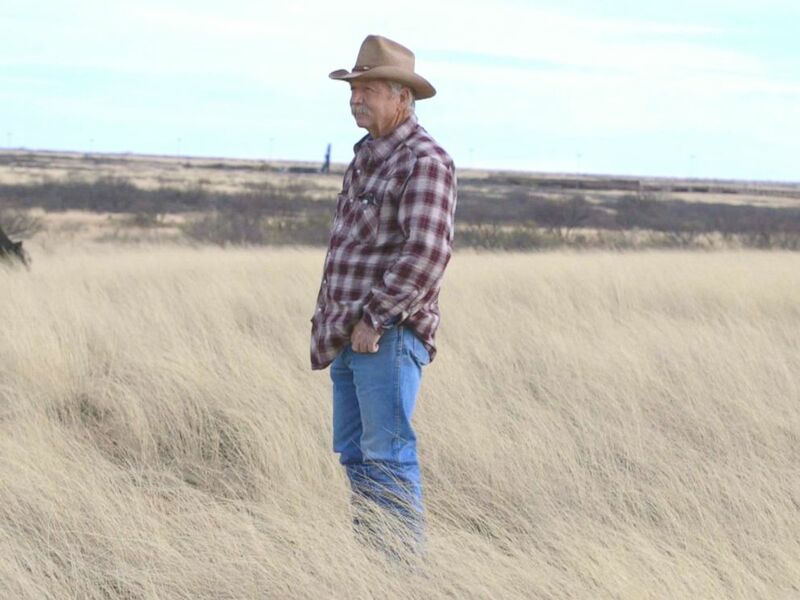 His family has owned 16,000 acres of land on the border with Mexico for 120 years, Ladd, 61, told ABC News. Before 1927, there was nothing separating the property from Mexico. Then there was a barbed wire fence built to stop diseases from spreading among cattle, Ladd said. In more recent decades, as concerns shifted from cattle health to border security, a mesh barrier up to 13 feet tall was erected. It was “real easy to climb” and could be sawed through, Ladd said. These days, much of the fence by Ladd’s property consists of steel tubing topped with metal plates that stretches nearly 20 feet high. There are 29 continuous miles of fencing of various heights that span from the mountains near Ladd’s house to the east of the nearby town of Douglas. Ladd, like the majority of other voters in Cochise County, a postage-stamp-shaped county at the southeastern corner of Arizona, voted for Trump. Ladd said he was excited about Trump’s presidential bid from the moment he descended his golden escalator at Trump Tower to announce his candidacy. Trump spoke extensively about unauthorized immigrants during the presidential campaign, starting with his campaign announcement, when he made headlines by saying some people who come to the U.S. from Mexico are criminals and rapists. “Somebody that lives in Iowa might not see it like we do every day, but it’s a huge problem. It’s economic. It’s security. And everything that he addressed was absolutely what we’ve been going through down here for 30 years. And that’s what I said — ‘If this guy has the courage to say that and you know it’s not politically correct, I like him,’” he said. Ladd said he’s seen firsthand what happens when people cross over illegally onto his land. “The most humanitarian disgrace is we’ve had 14 dead bodies on the ranch, and this isn’t very remote,” he said, noting that unlike some other ranches, his property is only a few miles from a public road. John Ladd's family owns 16,000 acres in Arizona, about 10 miles of which are directly on the border with Mexico. Most of the deaths on Ladd’s property over the past 30 years have been the result of exposure — from the significant temperature swings that come with being in a desert — or dehydration. “[Initially] there’s a certain amount of compassion, but I’ve lost it,” he said. And beyond the monetary cost, there’s an emotional one: At night he worries that people crossing illegally will try to break into his home while his family is sleeping, Ladd said. Despite his frustrations, he finds himself in a strikingly common situation for many Trump-supporting residents along the border. He doesn’t necessarily agree with Trump on his plan to build — as Trump said on the campaign trail — a “big, beautiful wall,” but he likes that Trump is addressing the topic of border security. The fact that security problems along the border are getting attention at all is enough to garner Ladd’s support, even if he doesn’t love the solutions that Trump proposes. 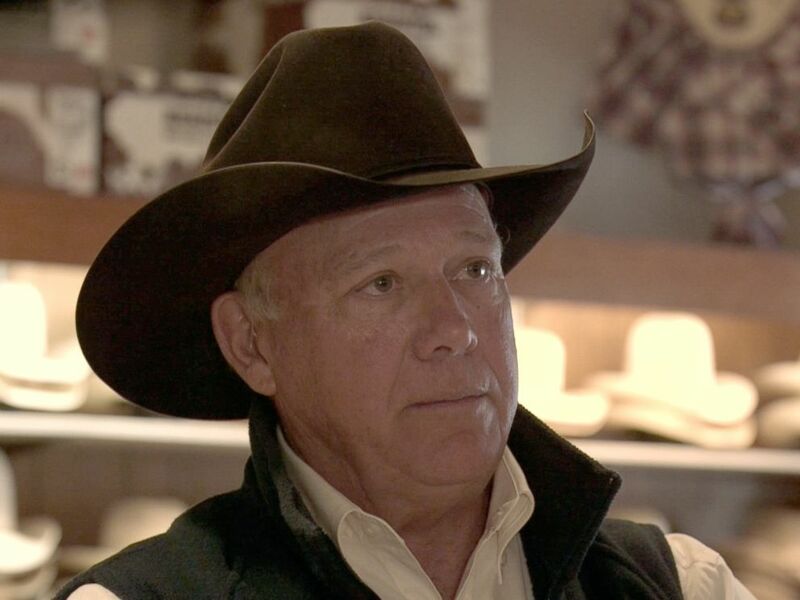 “Well, there is places on the [U.S.-Mexico border] that a wall would be useful, but our experience here on our ranch is [the fence] hasn’t been functional because there isn’t enough agents patrolling. And I think that a lot of President Trump’s wording is build a wall between Mexico and the U.S. … It’s a play on words, in my opinion. You know, even though I do believe he’s going to build some wall,” he said. There are a number of different types of fencing used along the border, some less difficult to climb than others. SOME 25 MILES EAST of Ladd’s property is the sleepy town of Douglas. It’s very clear that the roughly 16,500-person town has seen better and more bustling days. From the main shopping street lined with empty storefronts to the historic Hotel Gadsden, which has a makeshift museum with pictures of the balls that were held in its lobby in the early 1900s, the town’s former glory lurks in the background. But the border crossing remains busy. As the sun rises over the port of entry separating Agua Prieta in Mexico from Douglas, a steady stream of cars comes to the U.S., though the most trafficked area is on the pedestrian walkway. Groups of children walk across the border, making their daily walk to school an international trip. The amount of foot and passenger traffic into Douglas every day is sizable. According to CBP’s records for the 2016 fiscal year, more than 3.8 million people passed through the town’s port of entry on foot or by car. In March 2016 a total of 317,249 people passed through — roughly 10,234 people per day. That’s more than half the town’s population. “I’m certain there’s a misunderstanding about the importance of legal immigration versus illegal immigration,” said G.T. Bohmfalk, a Douglas resident who voted for Trump and owns Marlin’s Saddle Shop on the town’s main street. “Every day, people come across this border, and they’re legal entrants into the United States. They have shopping cards or visas or whatever, and they come across that border through the port of entry. There is nothing in the world wrong with that, and there’s only positives to be gained by that. Because our economy here in this town depends not so much on this town as it does on the Mexican citizens from northern Mexico coming across that border here. If you choke that down by politics or whatever, that harms this town and its economy,” he said. In March 2016, there were a total of 317,249 people who legally passed through the port of entry in Douglas, which equates to roughly 10,233 people per day. That's more than half of the town's population. And Bohmfalk, 66, should know. After 50 years of having it in his family, he has put his store up for sale. He told ABC News that his age and the desire to spend more time with his newborn grandson in Texas were the main reasons he decided to put it up for sale, but he also acknowledged that business is as slow as he’s ever seen. “You’ll find that most of these buildings down here are empty and even the businesses that are here like mine are not doing as well as we would like, and I’ve heard some of my other friends in business here say that this is as bleak and as dark as it’s ever been here,” he said. “For me to see businesses that have been open for so many years to close is a personal heartbreak,” she said. “I think for many years living on the border, we relied a lot on the money that came from Mexico to continue living. Right now, because of all the issues there is in Mexico, the money coming over isn’t as much as it used to be, where we see that businesses are slowly dying out because of things like this,” she said, referring to the decline of the Mexican peso. The peso has weakened against the dollar, from about 12 pesos to the dollar in 2012 to about 20 pesos today, meaning that Mexicans paid in pesos have less buying power in dollars than they did. G.T. Bohmfalk's family has owned a saddle shop on Douglas' busiest street for the past 50 years but he just decided to put it up for sale. “This wall to me is a distraction of what’s going on here. Because the wall will not affect the things that [Trump] calls critical, like the deficit. The wall won’t fix the deficit. The wall won’t fix trade,” he said. “The wall is only a security device.” But it’s a necessary one, he thinks. Bohmfalk voted for Trump but wants to be clear that while he respects him now that he is president, he is not a die-hard supporter. “Don’t be mistaken here and think that I like him. I’m willing to tolerate him because he says things that I like to hear,” Bohmfalk said. 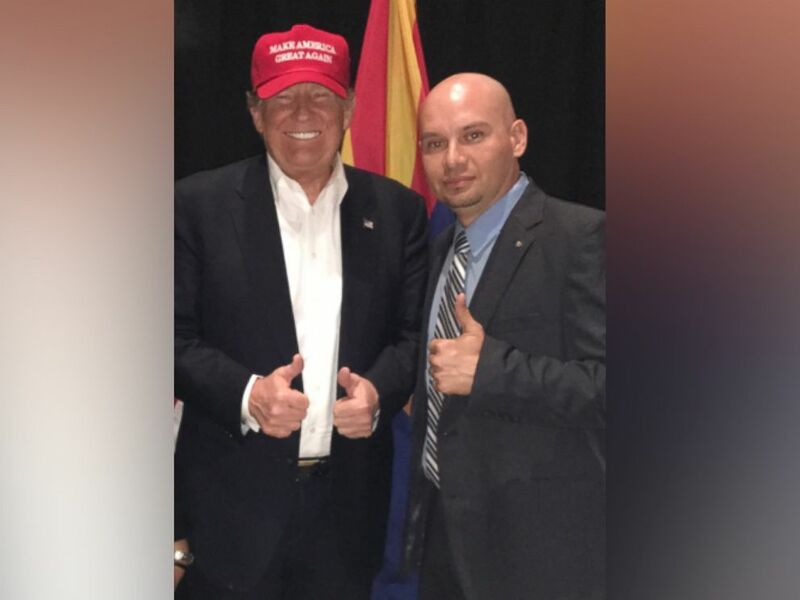 ONE SUCH PERSON Trump said he has listened to is Art Del Cueto, a Border Patrol agent, the vice president of the National Border Patrol Council and the president of the Border Patrol union Local 2544. 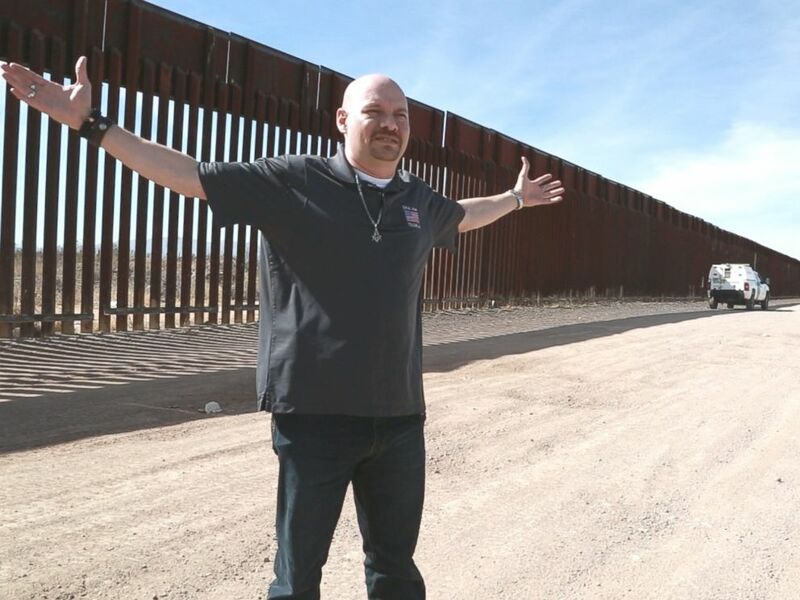 Del Cueto, 43, is “very proud to say” that his union was the one that “spearheaded the [Border Patrol] endorsement of Donald Trump” in March 2016, and he said that support comes largely from Trump’s attention to border issues and his outreach to Border Patrol groups. Del Cueto was at Trump’s victory party at the New York Hilton Midtown on election night, and he proudly shows a cellphone video of Trump pointing to him and a friend, a fellow Border Patrol agent, after getting off the stage. Art Del Cueto, right, told ABC News that he met Donald Trump multiple times. Del Cueto said his dedication and interest in the safety at the border stems from childhood in Douglas. He said it feels as if he has “been involved [in Border Patrol] my whole life.” He has seen firsthand the danger that agents come across, which is partly behind his reasons for wanting a wall, he said. “It’s a high-level game. It’s a high-risk game. It’s agents that put their lives on the line every day. You don’t know if you’re going to come home that night,” he said. According to the CBP, there were 585 assaults against CBP law enforcement personnel in fiscal year 2016. “We realize that we’re a family, and sometimes we’ve seen in Washington and through different administrations that the only backup that we have is ourselves," he said. One way that he thinks the wall will make his fellow agents safer is by making it more difficult for some malicious people on the other side of the fence who “rock” agents. Art Del Cueto is a Douglas native who works as a border patrol agent. His union "spearheaded" the Border Patrol endorsement of Donald Trump. 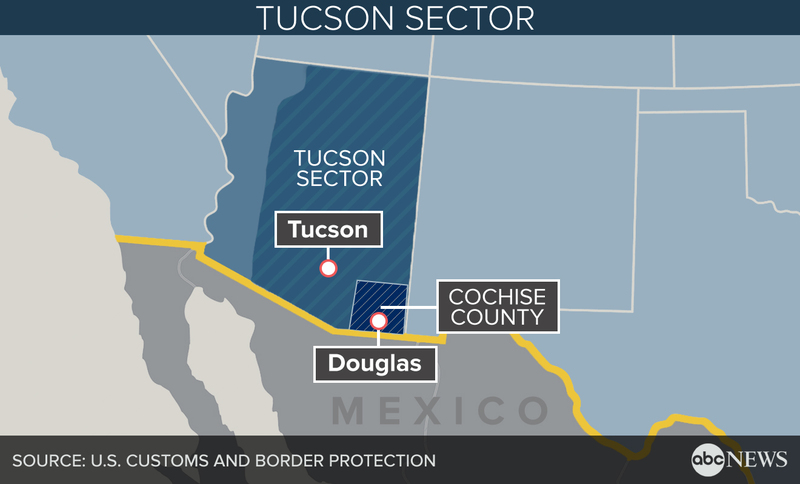 As of Feb. 18 of this year, there were 3,795 Border Patrol agents working in the Tucson sector – the section of the border that includes Douglas – according to Border Patrol, making it the most-staffed sector along the country’s borders. That equals about 14 agents for each of the sector’s 262 miles. 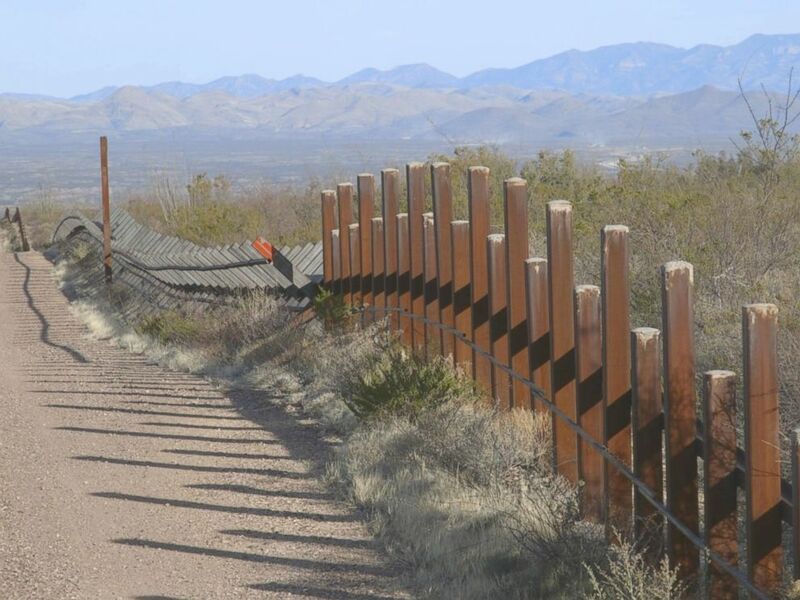 During the 2016 fiscal year, the Tucson sector had the most marijuana confiscated — 728,367 pounds — of all the sectors and the second-most apprehensions of people crossing illegally: 64,891. CBP reports that there were 84 deaths along the border there during that period, making it the second-most fatal sector. Del Cueto thinks that the current fence is insufficient and that a solid wall would make it more difficult for people to “rock” agents, and he hopes that Trump follows through on his campaign promise to build a wall. “Ideally a wall, a real wall, works a lot better. It will be closed off. It will be solid. It will be harder to [scale],” he said. But Shani Zepeda, 31, who grew up in Douglas and teaches social studies at a local high school, is more skeptical. “What kind of a wall is he even going to construct to potentially keep out whomever? If there’s a will, there’s a way, and whatever wall he’s going to build, I think it’s penetrable, you know, with the right equipment,” she said. Shani Zepeda thinks that the wall is "definitely a racial issue." 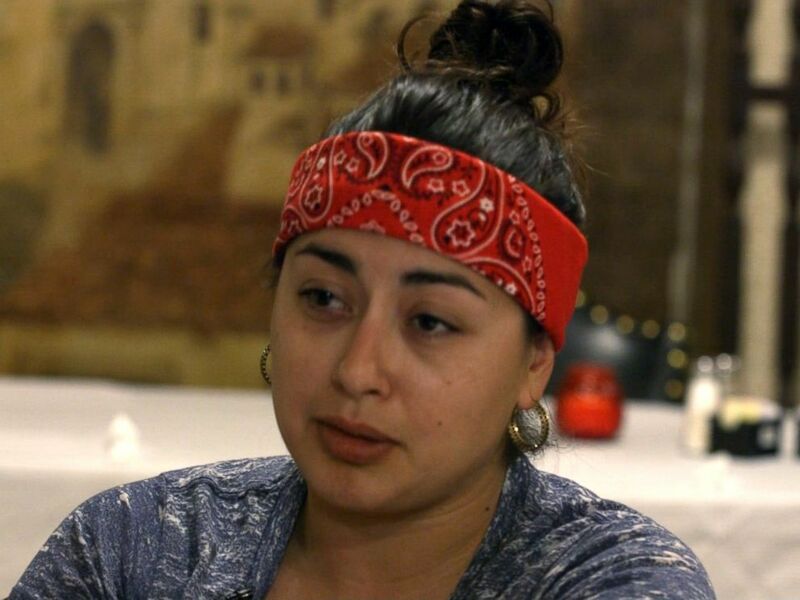 Zepeda, who says she “exercised her right not to vote” in the 2016 election, thinks the proposed wall is about more than just creating a physical barrier to keep out unauthorized immigrants. Del Cueto doesn’t see it that way. He insists racism isn’t at play and the wall is about the security of the nation. THE ISSUE OF HATE – and the at times anti-immigrant rhetoric that surrounded Trump’s immigration policy proposals, including the wall, during the campaign – is one that has been felt on a personal level in Douglas. 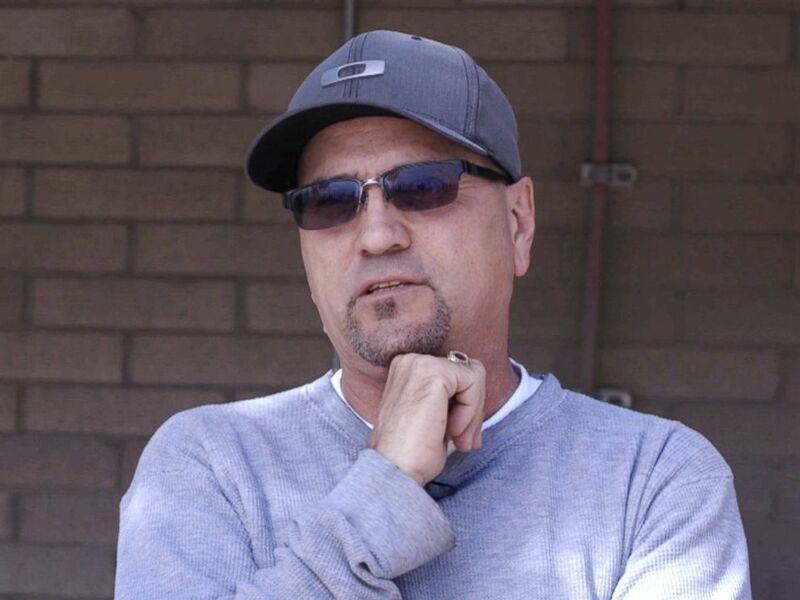 Alex Espinosa, 55, also grew up in Douglas, and his parents are immigrants from Mexico. He said he was subjected to criticism because of his support for Trump. He runs a business creating headstones that is three blocks from the border fence. He said he understands how interconnected Douglas is with Agua Prieta, directly on the other side of the fence. 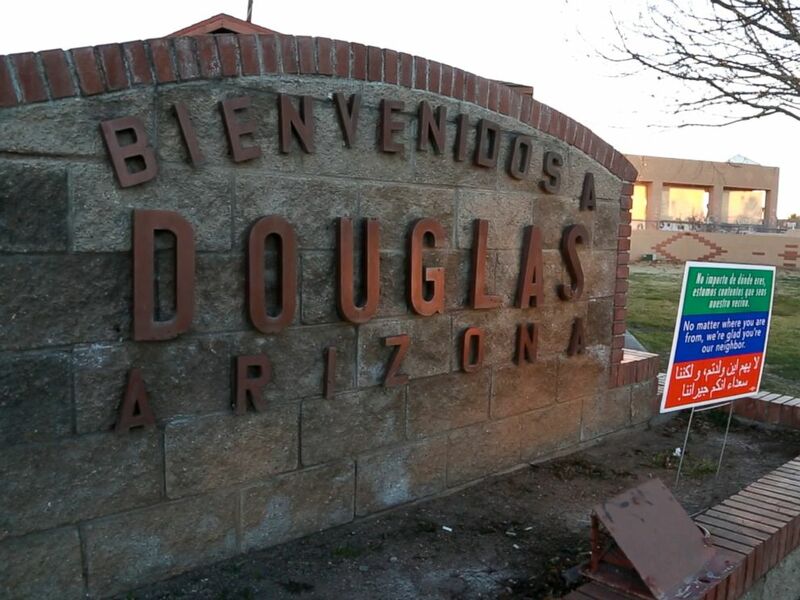 “A lot of the families here in Douglas are from Agua Prieta, and it’s always been a practice for people to work over there and live here or work here and live over there,” he said. Alex Espinosa has ties to both sides of the border: His parents are Mexican and migrated to the U.S. legally, and while he is a U.S. citizen, he grew up going to school at the town across the border, Agua Prieta. Espinosa has ties to both sides of the border: His parents are Mexican and migrated to the U.S. legally, and while he is a U.S. citizen, he grew up going to school in Agua Prieta. “We used to be able to go over there to restaurants and take our family. Now, people — a lot of the people that I know — won’t do that anymore. I don’t do that anymore. I used to. I’d rather not,” he said in reference to what he sees as a growing level of violence. He added, “I’m not saying all Mexicans are bad, because my mother came over here. My father came over here. But there’s a lot of bad people that shouldn’t be here, and then a lot of them come over here and they abuse our system of government assistance and, like, the health insurance.